Nicosia, the capital of Cyprus, is home to many beautiful landmarks that embody the island’s fascinating history. From ancient monuments to exquisite galleries, here’s what shouldn’t be missed when you’re in Nicosia. Café culture is an essential part of life in Cyprus, so be sure to indulge in a hot drink with one of the many delicious pastries and traditional cakes on offer in coffee shops across the city. Locals love To Apomero, a small café hidden in an alley just off Ermou, its name aptly meaning ‘secluded’ in Greek. Splitting the island in two, Nicosia’s Green Line extends across the capital, with various checkpoints along the way. The main one can be found at Ledra Street, an entry point where people can cross over to the other side. 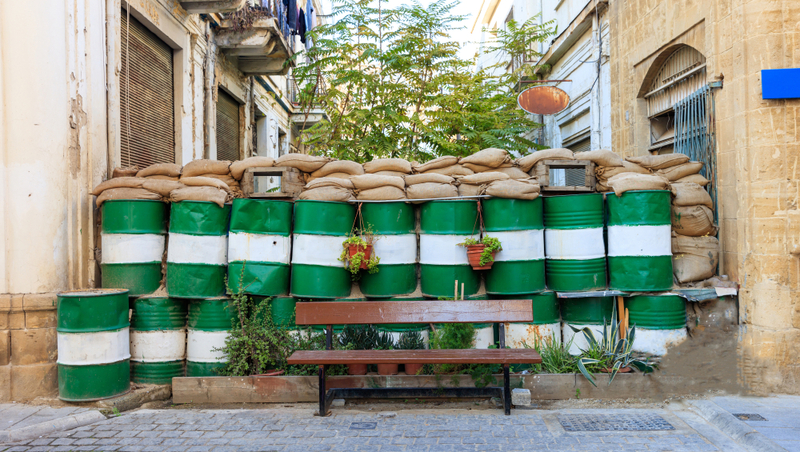 Nicosia is the only divided capital in the world, and visiting the city’s Green Line is a great way for visitors to explore the social and political situation on the island, as well as its fascinating history. Head to OHI roundabout where local sellers lay out their goods every Wednesday and Saturday from 6am to 4pm. Here, you’ll find all kinds of fresh products from fruit and vegetables to eggs and nuts – it’s the perfect place to savour the local produce. Even if you’re not planning on cooking anything, a visit to the farmers’ market is an experience in its own right. Watch how the locals interact and how the sellers shout out and announce their products to entice customers. It’s best to head here in the morning, as things sell quickly and there’s not much action after lunchtime. Visiting some of Nicosia’s greatest museums and collection galleries is a fantastic way to gain insight into the island’s art scene and ancient traditions. For an overview of Cyprus’ complex and fascinating history, visit the Leventis Municipal Museum of Nicosia in the heart of the Old Town. Expect to find engaging exhibits, clear information in Greek, Turkish and English, and a cool interior that makes a welcome break from the baking sun. Admission is free, and this makes a great stop for keen historians and families alike. 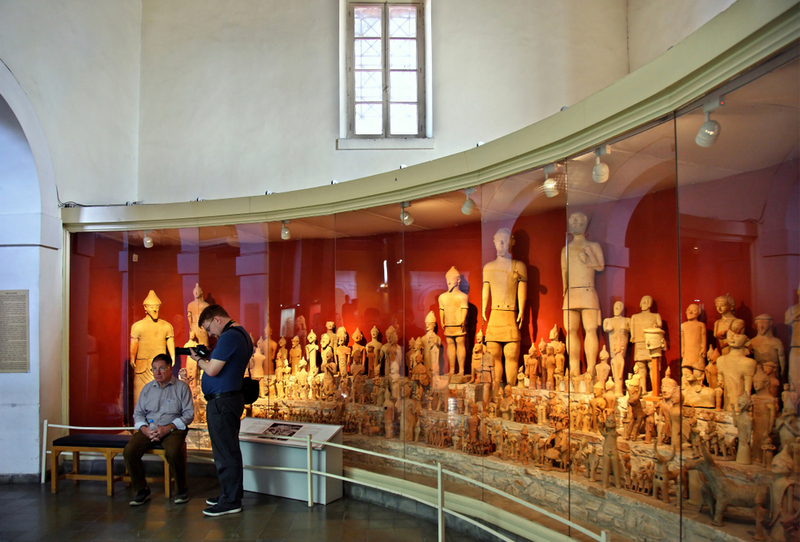 Another must-visit museum is the iconic Cyprus Museum, the largest and oldest archaeological museum on the island. Its rich collection demonstrates the turbulent and significant role that this tiny country has had in European history, while the building itself is emblematic of the pride Cypriots have in their heritage and culture. The third cultural spot worth visiting is the Nicosia Municipal Arts Centre (NiMAC), the oldest Contemporary Arts Centre in Cyprus, which hosts exhibitions from local and foreign artists. Admission is free. 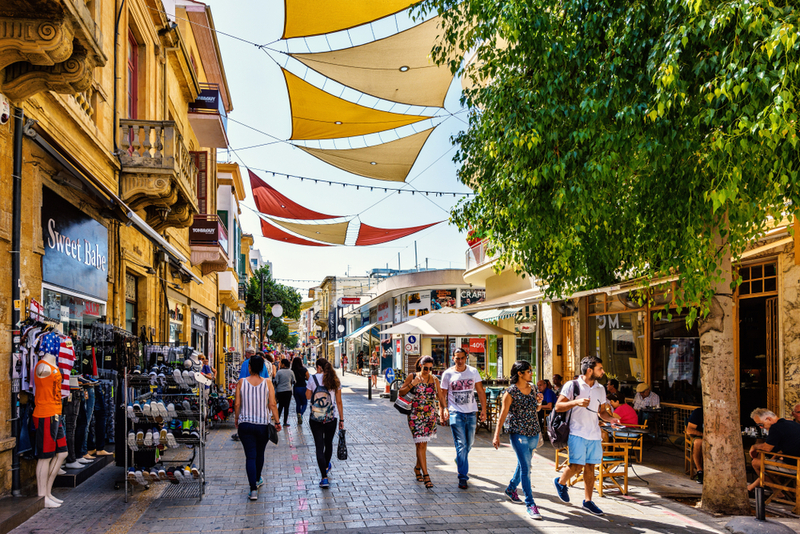 The best-known street in Nicosia is the pedestrian Ledra Street, which is filled with shops, bars, cafés and eateries, and ends at one of the most popular checkpoints on the Green Line. 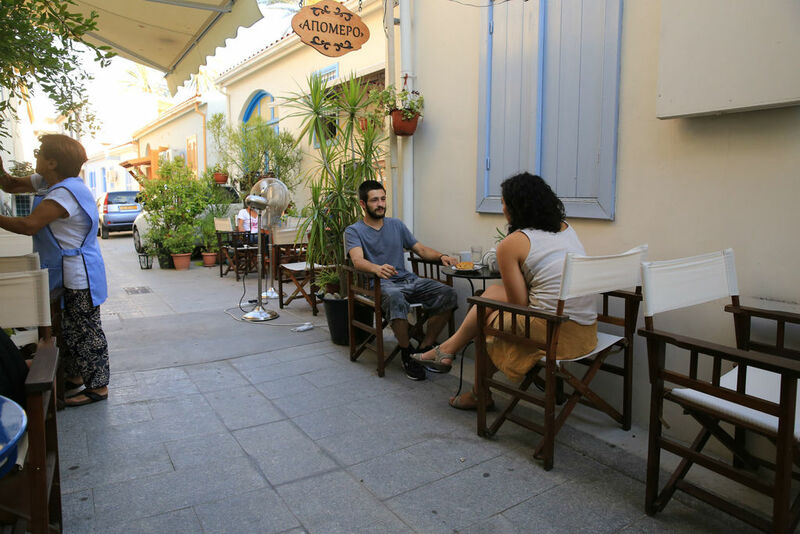 Parallel to Ledra is Onasagorou, an equally busy street that has flourished in the last decade with bars and restaurants, bringing life back into the Old Town. A bit further down NiMAC is Ermou Street, which is home to many old Cypriot craftspeople. Off Onasagorou Street you’ll find a dozen little shops that make up a pedestrian neighbourhood called Laiki Geitonia. 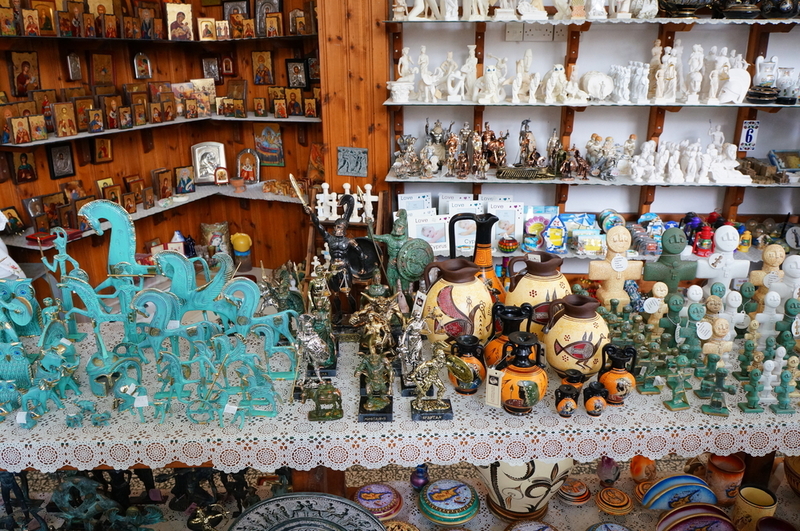 This is the ultimate place to visit if you want to do some souvenir shopping, as the shops sell everything from olive oil and zivania (a traditional alcoholic drink) to Cypriot sculptures and lace embroidery. The friendly shop owners will definitely engage in conversation as you explore their goods. Although Laiki Geitonia has a couple of taverns, for a more local experience head to one of the Old Town’s eateries, otherwise known as mayiria. These eateries serve daily home-cooked, traditional meals and are the closest you’ll find to eating at a Cypriot home. Try Shiantris or Mathaios – both in Old Nicosia – or Stoa tou Dimitri just outside the walls of the city. 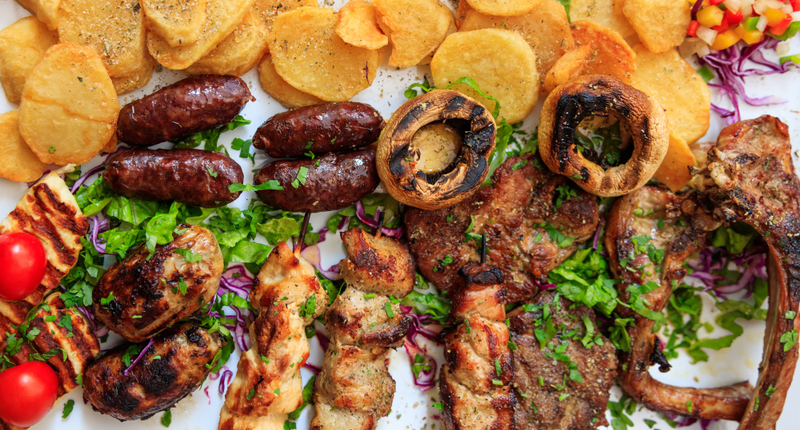 A visit to Cyprus can’t be complete without trying a pitta of mixed souvlakia: grilled meat skewers and sheftalia sausages with salad. It’s a traditional island dish. As an island of mixed faith, Cyprus and all of its towns contain beautiful historical relics of Islamic and Christian origin. The Sacred Temple of Virgin Mary Phaneromenis is no exception. It is still a functioning house of worship, and all are welcome to attend services as well as marvel at the antiques and intricate murals. The church is the largest in the old part of Nicosia – its Venetian architecture is outstanding. Its elegant structure has led to it being called the ‘Lady of Nicosia’ and it is well worth a visit. Situated in the heart of the Old Town and surrounded by many cafés, all roads lead there and it’s unlikely you’ll miss it. This is one of the funnest (and most leisurely) ways to explore the city, and is a quick means of manoeuvring between many of the town’s unmissable landmarks. 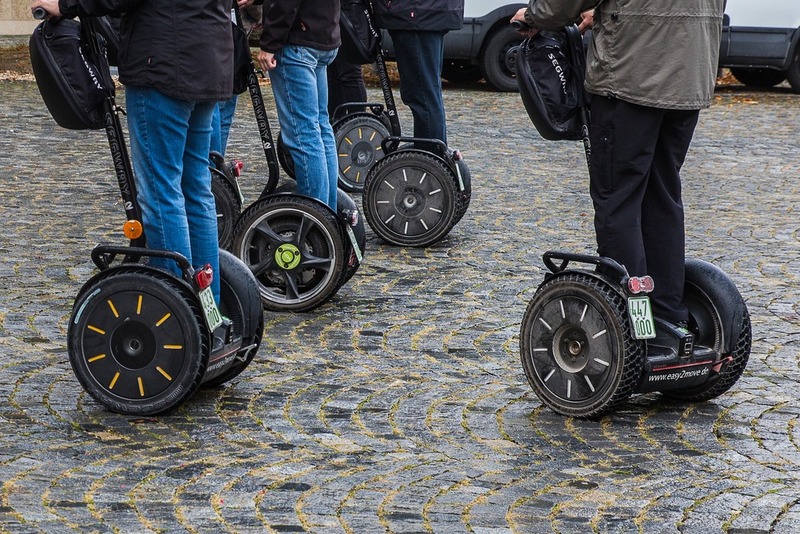 Groups are provided with a guide and individual Segways, as well as some basic training and safety talks. The guides are experts on the local area and will use their native knowledge to make tours fun, educational and unlike any other tour provided on the island. Although you won’t see any locals on Segways, it’s an exciting way to see the town, especially for children. This large stretch of greenery is the closest thing to a forest you’ll find in Nicosia. Located in the suburbs of the city, it stretches over 840 hectares (three square miles) and hosts a beautiful lake, the park’s signature feature. There’s plenty of space for children to play, either amongst the trees or at the playground which is near the park café. For animal lovers, there’s a designated dog path that circles the park and offers fantastic city views. Head to Athalassa for a picnic, a walk or to get your dose of nature. A more luxurious way to unwind in Nicosia is by visiting the stunning baths of Hamam Omerye. There are numerous treatments to try in an environment that oozes relaxation; part cleanse and part massage, you will be treated to relaxation so deep and rejuvenating, you’ll leave feeling revitalised. In the heart of the Old Town, from the aromas to the distinctive dome of the hamam, this is an unforgettable experience that also highlights the town’s mixed identity. Situated further out of Nicosia, the acclaimed Machairas Monastery is considered one of the most important religious sites of Cyprus. The monastery, situated high in the Cypriot hills and surrounded by ochre dust and lush green trees, is home to the icon of Panayia of Machairas, believed to have been painted by the apostle Luke. The building, with its rustic brick walls, red roof tiles and rectangular open layout, is visually stunning. You might catch a glimpse of the monks that reside there, all of whom live off their agriculture activities. This is a prime location to enjoy a spiritual atmosphere of peace and tranquillity.